Carona Manufacturing Co. - we are the leading manufacturers for Water Based Promotional Tattoos in Mumbai also called as promotional tattoos or temporary tattoos, transfer tattoos, free tattoos, kids tattoos, gents tattoos. These are a very fun and inexpensive way to promote brands, products of corporate by giving them as free items. Many confectionery/snacks/biscuit/cookies manufacturing companies have made this a signature trademark free gift product and are getting a tremendous response from customers and are repeatedly doing campaigns with us. Completely non toxic glue and inks sourced from the leading suppliers and certified for quality. (available certificate). We have done numerous campaigns for the same in the past 5 years. 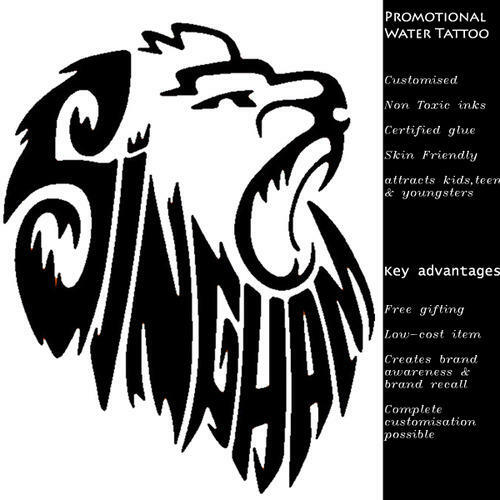 These tattoos are ideal for brand building ,promotions for corporate like FMCG companies, pharma companies, event management companies, theme parks, social awareness campaigns, sporting events like IPL, kids, night clubs, movie launches ,product launches etc. We can do any design and size as per clients need at extremely affordable prices. We Carona Manufacturing Company from 2005 are a leading company in this domain engaged in manufacturing and exporting a wide range of finest quality Temple Jewellery, Imitation Fashion Jewellery, CZ Bangles, Traditional Kemp Jewelry, Victorian Jewelry, American Diamond Jewelry, Costume Jewelry, Kundan Jewelry. Our product range encompasses best quality Temple Jewellery Coin Necklace Set, Coin Temple Set, Religious Jewelry, Temple Coin Set, Temple Jewellery Coin Set, Temple Jewellery Coin Sets, Temple Jewellery Earrings, Kids Tattoos, Promotional Tattoos, Promotional Kids Tattoos and Promotional Temporary Tattoos. These products are admired for their high quality and attractive design features.